When the English king granted Virginia a royal charter in 1624, the Church of England (the Anglican Church) became the established church of the colony. Tax monies supported the clergy and the church. Preachers of dissenting sects were required to obtain licenses in order to preach. Preachers who refused, such as the Baptist Jeremiah Moore, risked imprisonment and fines. 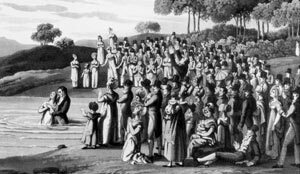 In the years leading up to the American Revolution, persecution of dissenting preachers intensified. As colonists clamored for increased liberties and Revolutionary fervor swept the colonies, however, Virginia began a 10-year struggle to redefine the relationship between church and state. Three groups vied for supremacy: traditionalists who believed that religion was essential to maintain social order and sought to maintain financial support of churches; rationalists like Thomas Jefferson and James Madison who believed that separation of church and state was essential to guarantee liberty of conscience; and dissidents, including Baptists, Presbyterians and Methodists, who sought to keep the church free of the corrupting influence of government. Those who wanted to maintain state support of the church were largely members of the propertied class; those who opposed it were primarily unskilled laborers and other members of the worker class. The struggle among these groups severely strained the social fabric of the Commonwealth. In May 1776, the colonies were called upon to draft new constitutions to govern the soon-to-be-created states. James Madison, a 25-year-old representative to the Virginia House of Delegates, submitted a bill to change the constitution from one that granted "tolerance" of dissident sects to one that recognized the "free exercise" of religion. Dissenting religious groups such as the Baptists flooded the Legislature and demanded an end to continued support of the church. Then in 1779, Thomas Jefferson, author of the Declaration of Independence and delegate to the Virginia Legislature, submitted the Virginia Act for Establishing Religious Freedom. The act was aimed squarely at undoing state support for the Anglican Church. Jefferson and Madison found allies in dissenting Baptists. But many opposed this measure, including the fiery orator of the Revolutionary cause, Patrick Henry, who believed that religion was essential to cultivate a moral citizenry and that without state support religion would simply wither away. In 1784, Henry submitted a bill that would impose a tax to support churches, but would allow each citizen to designate which church their taxes should support. The following year, Madison wrote an important and powerful argument against any state-supported religion, titled "Memorial and Remonstrance Against Religious Assessments" Henry's bill went down in defeat. Madison then reintroduced Jefferson's Virginia Act for Establishing Religious Freedom In 1786, the bill passed, formally ending state support of organized religion. "I flatter myself [that the act has] in this country extinguished forever the ambitious hope of making laws for the human mind," Madison wrote to Jefferson. Indeed, the Act for Establishing Religious Freedom was so important to Jefferson that it was one of three accomplishments he chose to commemorate on his tombstone.